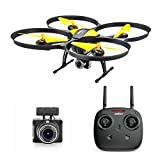 Altair 818 Drone Review 2019 – is the Altair 818+ quadcopter worth the money? Review of features, pricing, flight duration, battery, camera and more. The Altair 818 Drone is essentially an outstanding upgraded edition of the original drone made by the company, the Altair Aerial AA108. It is still quite beginner-friendly due to features like headless steering, multiple speed modes and its capacity to hold altitude. 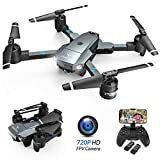 However, the drone now has much improved utility for videography and photography because of a extremely stable hover and its long battery life. The Altair 818 has several flight modes for different levels of skill. 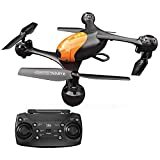 That makes it an incredible beginner drone for individuals to learn to fly and progress up the skill ladder. There are 3 different levels of skill for flying. The first level is ideal for both beginners and kids, the second is of a medium skill level for individuals with a bit of experience and the third level is for advanced flyers. Advanced flyers have the option of flying in first-person by using the app. They will be able to enjoy the remarkably impressive speed. First timers can remain in the lowest speed mode and relish in a number of beginner-friendly features. The 15-minute flight time delivered by the Altair 818 Drone is arguably its best new feature. The flight duration is almost totally unprecedented in drones that cost under $500. Even more impressive is the fact that this flight time is off just one battery and the Altair 818 comes with two. This means that you will be able to fly the drone for 30 minutes each time with fully-charged batteries. Obviously, recreational users will enjoy this feature as they will get to spend more time with this awesome new toy. Just like the AA108, the Altair 818 comes with a 720p wide-angle, high-density camera. Shots can be lined up from higher up in the air or much further away; this is difficult for most quadcopters to do. However, the best feature of the long-lasting battery life is that it eases the process of capturing photos and videos. As the name suggests, this feature takes the hassle out of having to get the quadcopter into the air yourself or be concerned about carefully landing it. The work will be done through pressing a single button. This mode enables the Altair 818 to hover in the air in the same position. It is particularly useful for capturing photography. In heading hold mode, the front of the device is always facing away from you and set to the side. This is an indication that you do not have to be concerned about correcting for left or right, if the drone gets spun by the wind. It provides a more natural technique of learning how to control a drone, particularly if you are familiar with its videogame-like controls. 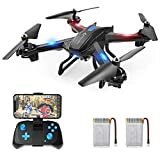 • The drone has flashing lights and beeps if the battery gets low or the device gets out of range. In addition, it automatically lands itself before the battery dies to avoid crashes. The Altair 818 Drone is tremendously durable like its predecessor, the Altair AA108. One user has reported that he was flying in extremely windy conditions and the quadcopter flew out of control and ended up in a lake. However, none of the electronics got damaged and after quickly toweling the drone, it flew flawlessly. Its much larger prop guards are responsible for preventing damage during a crash. This feature is extremely essential for novices, who are more prone to causing accidents than advanced fliers. Compared to its predecessor the Altair Aerial AA108, the Altair 818 Drone is equally as easy to control. Therefore, pilots of varying skill levels should experience no trouble with operating this drone. The 818 has three speed modes that range from extremely lenient to amazingly fast. Similar to the AA108, the Altair 818 is equipped with a wide-angle, 720p HD camera. In contrast to the AA108, it has the capability to capture video straight out of the box and can stream first-person videos up to 66 yards away to the FlyingSee app. Unlike the AA108 that provides a flight time of up to 7 minutes, the 818 provides up to 15 minutes of flight time and it comes with two batteries, so you can get up to 30 minutes of flight time. While the speed of the 818 is impressive, it has lost a bit of the yaw of its predecessor. The shape of the drone is a lot more aerodynamic and stable when compared to the AA108. This indicates that an issue with the original drone has worsened significantly – how it performs in the wind. This does not only happen in a strong gust, even a slight elevation in the wind level could affect the drone. The new shape of the prop guards and slight increase in shape and weight indicates that the drone could be carried off in almost any wind. However, this is not a deal-breaker but a concern of most drone hobbyists. It is important to keep in mind though, especially for those who reside in a region with a lot of harsh weather. The Altair 818 Drone is ideal for drone hobbyists who are interested in videography, photography and drone racing. It is priced fairly and it comes with protection for the motor and rotor blade. This ensures that it will remain intact while you learn the art of skillfully maneuvering the device along its flight path.